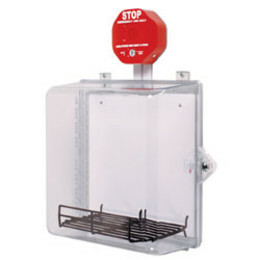 Protect automated external defibrillators (AEDs) from abuse and accidental damage with this polycarbonate cabinet. Unlike metal boxes, STI's cabinet allows AED units to be highly visible. It mounts on the wall enabling appliances to be stored in a central location and is capable of housing CPR accessories. This cabinet is secured with a thumb lock, allowing easy access. The polycarbonate is backed by a three year guarantee against breakage in normal use (one year on electro mechanical and electronic components). To further protect against misuse, vandalism, and accidental damage, STI equipped this model with a siren. 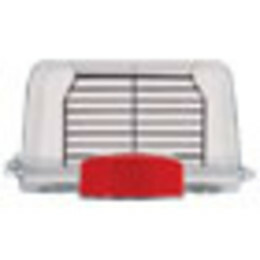 When the cabinet is opened, the siren sounds a powerful 105 dB warning horn, drawing immediate attention to the area (95 dB low volume setting can be set if desired). The alarm does not interfere with legitimate usage of the electronic product. Alarm has many choices including volume, duration, trip delay and arming delay. Clear polycarbonate cover allows visibility from any angle and does not require a sign. Equipped with auto siren. For complete alarm details see install sheet. Siren sounds a powerful 105 dB warning horn when activated, drawing attention in a hurry (95 dB low volume setting can be set if desired). 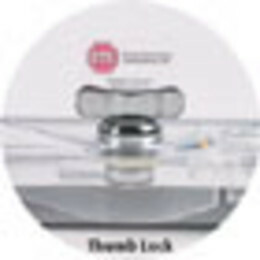 Additional opening where secondary pad lock or safety seal can be used. Three year guarantee against breakage of polycarbonate within normal use (one year on electro mechanical and electronic components). Cabinet offers rounded corners to help prevent injury.